Saturday, May 22nd, 2010, at Flying Saucer in San Antonio with Chris. Seven years ago – Saturday, May 22nd, 2010 – I eagerly rode my moto down to San Antonio to visit my brother for the weekend. I remember meeting up with Chris on his Sportster just south of Blanco, near the FM-165 / US-281 intersection. We might have gone over to Blanco Road after that (and possibly turned around, because of heavy flooding that year that blocked Blanco Road west of Bulverde). We had some really enjoyable beers and conversation that evening at Flying Saucer, near Chris’s apartment. The ritual always included running Sunday morning, followed by breakfast across town at the Jim’s on McCullough and Loop 410. May is a tough month. It’s the month we lost Chris the first time. It’s the month Chris graduated from Texas. 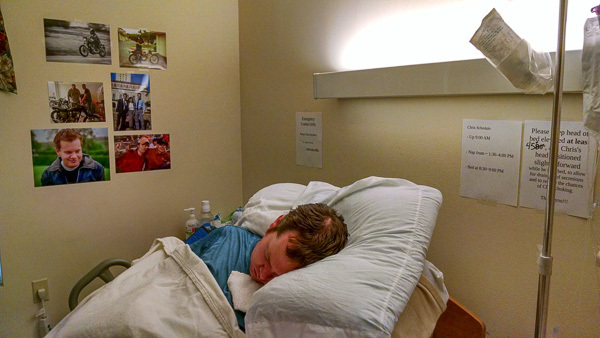 It’s the month he was studying to take the GRE for grad school, his June test date and e-mail reminders slipping by as our new reality unfolded in the Neuro ICU. It’s the month, a year ago, that we lost Chris the second time. 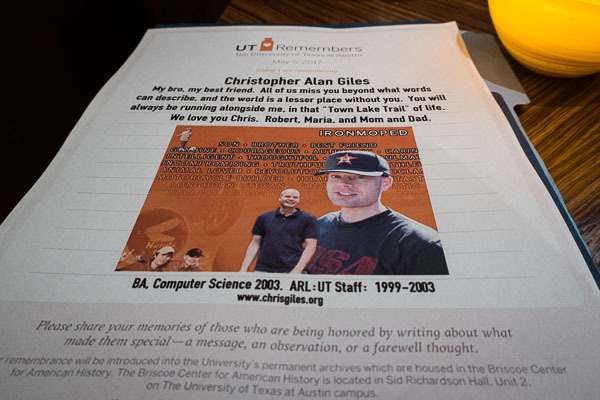 It’s the month, this year, that Chris’s name was read aloud on campus again, but this time with a bell toll from the tower instead of a raucous, celebratory cheer. 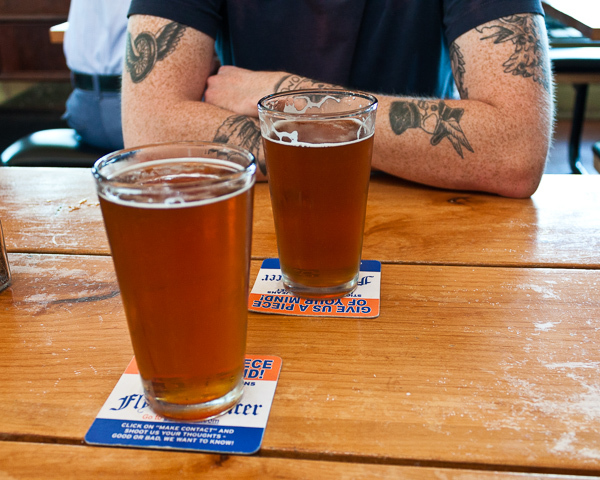 Maria and I are going to have some late afternoon / evening beers at Flying Saucer in San Antonio on Saturday, May 20th, to raise a glass for my brother Christopher, and to look back at the good times. Please feel free to join us and remember Chris! 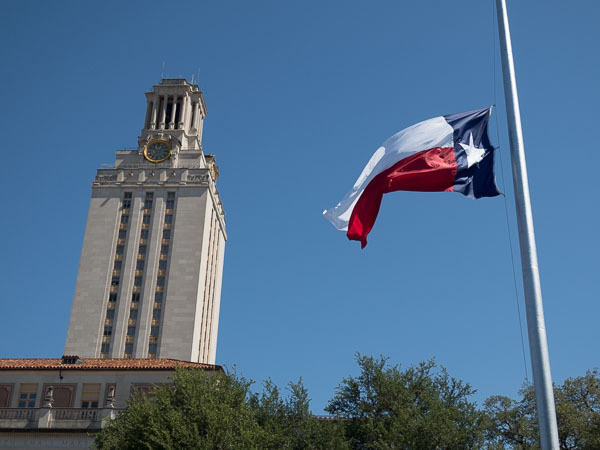 Every year since 1998, The University of Texas at Austin has held a day of remembrance to honor members of the university community – students, faculty and staff – that have died in the previous year. While enormously unfortunate for everyone in attendance, it’s also comforting to participate in kind of a shared grief ceremony like this – you’re definitely not alone. There will be a memorial for Christopher in Austin, Texas, on Sunday, June 5th, 2016, at 2PM. RSVP: Please reply to this posting here, or send me a note on FB / e-mail if you are planning on attending, so we can get a more accurate headcount for the folks at Saucer. My brother, Chris, unexpectedly passed away early this morning at my parents house in Alabama. I’ll post more information when we figure out what the next step is. 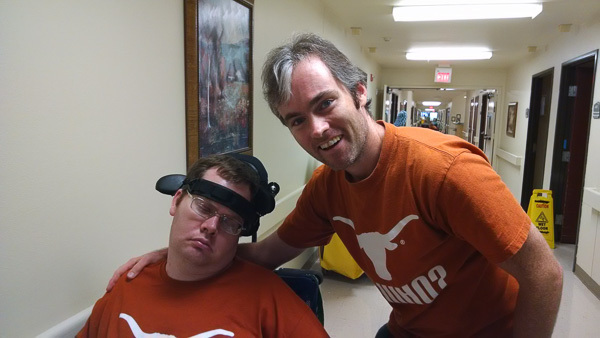 So my parents were able to arrange some much-needed time off again, and this year, we decided to bring Chris to a skilled nursing facility in Austin, Texas, instead of me taking care of him at my folks’ house in Alabama. Mom and dad also planned a single day stop in Houston on the way to Austin, for a brief evaluation at TIRR and for a routine refill of Chris’s Baclofen pump. Very early the next morning at the hotel, around 3am, Chris began having very dangerous continuous seizures, and my parents had to take him to the emergency room at Memorial Hermann Hospital. Chris ended up in the Neuro ICU, knocked out on Ativan and monitored on an EEG cart, much like last year at Huntsville Hospital. One of the evenings saw some staff ‘procedural panic’ set in after Chris choked on excess saliva, which lead to further complications – they scraped up Chris’s throat pretty badly and ended up causing some really unnecessary bleeding into his stomach. Ghah. At one point, one of the physicians was telling my parents that Chris was going to expire because of a somewhat low oxygen level in his blood. I’d seen this same temporarily low number – 85-90% – last year at Huntsville Hospital after the seizures, but it returned to normal (99%!) after he came around again. This observation from last year talked everyone down off the cliff… but good grief, it was unnecessary added stress. Chris also needed a PICC line to receive intravenous medication (folks that aren’t self-mobile tend to be difficult to ‘stick’ in the usual spots). A few days later, he developed a fever and an infection of the central line was suspected. Serious antibiotics. Thankfully, blood tests revealed no infection, and the fever broke on its own ‘somehow’. All these things continued to incrementally tack on a day or two to Chris’s hospital stay, which meant rebooking flights, and rebooking flights, and rebooking flights (props to Delta for being so accommodating). My folks were kind of resigned to scrapping their holiday at this point, but at least Chris was OK!!! This dude is still smiling, even after what he’s been through (again). 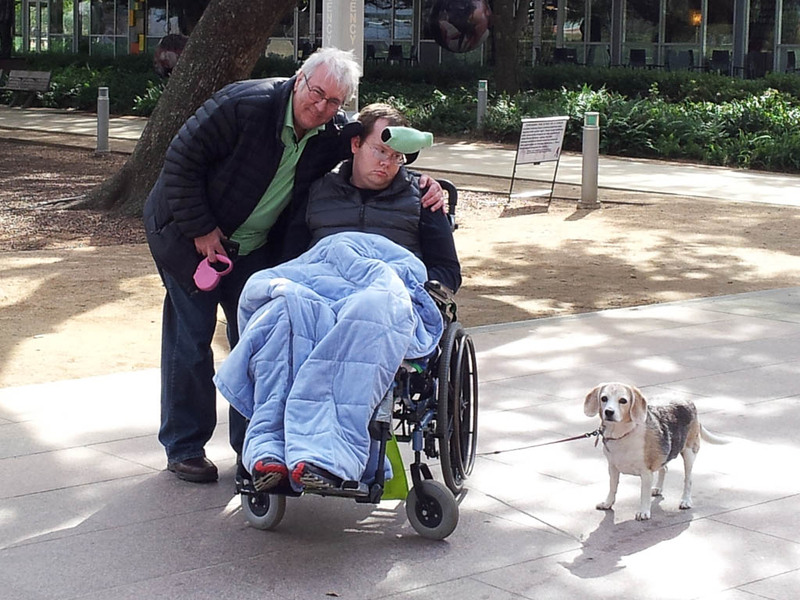 After almost two weeks in Houston, they finally managed to have Chris discharged from Memorial Hermann. PICC line freshly removed and the wound covered with a bandage! No more seizures! No infections! 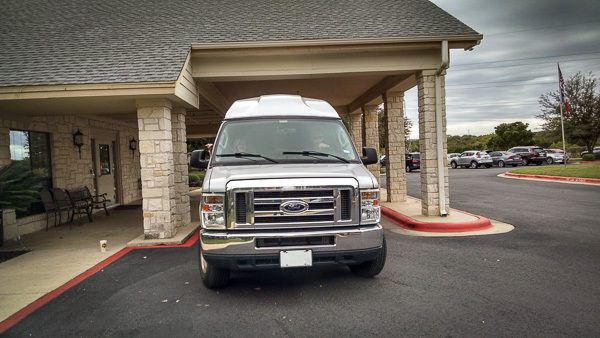 It was cutting it really close to still make their thrice-rebooked vacation flight and get Chris settled in at the skilled nursing facility – Park Bend – in Austin. Yikes! My parents had a weekend to get to know folks and provide some “Chris OJT” at the nursing home before they were off on their trip. I was anxious about looking after Chris, but really glad my folks were able to GET ON THE PLANE before some other calamity unfolded!!! I spent about six to eight hours throughout the day, every day, at the nursing home keeping an eye on things, training folks and trying to come up with fun stuff to do with Chris while he was in Austin. While it’s absolutely essential for anyone in a medical facility to always have a patient advocate, I will say that the nursing home staff – across the board: CNAs, LVNs, RNs, admissions, DON, facility nurse practitioner, facility administrator – outperformed many hospitals while taking care of this young traumatic brain injury survivor. Spending some time in the garage, after adjusting the clutch cable on the Triumph. Watching the Kansas State game on the nursing home’s big screen! Chris was usually knackered after watching even half a football game, heh. We used to go running together at the Camp Mabry track. The fall weather was absolutely perfect. It was bloody fantastic having my brother in Austin again, and to witness him smiling all the time. Woohoo! He would smile on cue at some pretty obscure Simpsons humor. He smiled a lot during the lecture at the TACC visualization lab on campus. 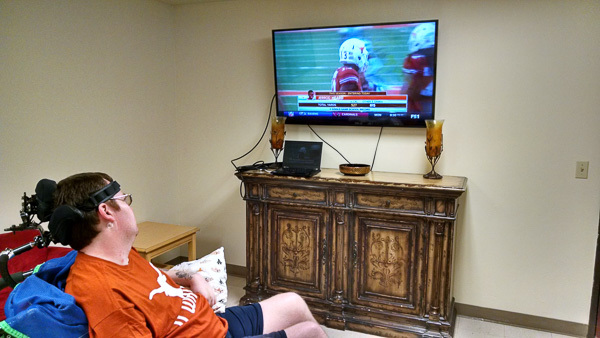 He smiled tremendously while watching the Texas – Kansas State game. 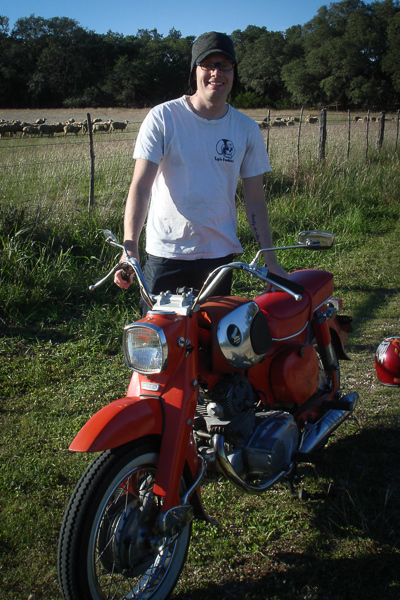 He smiled while starting up the Triumph. The smiling confirms that Chris does still have language comprehension and some amount of facial motor control. He was also more easily able to turn his head to the right spontaneously this time, and he did so several times without being prompted (to watch a nearby television, for example). I think Chris’s daily experience might be similar to this man’s: VIDEO: How my mind came back to life — and no one knew. 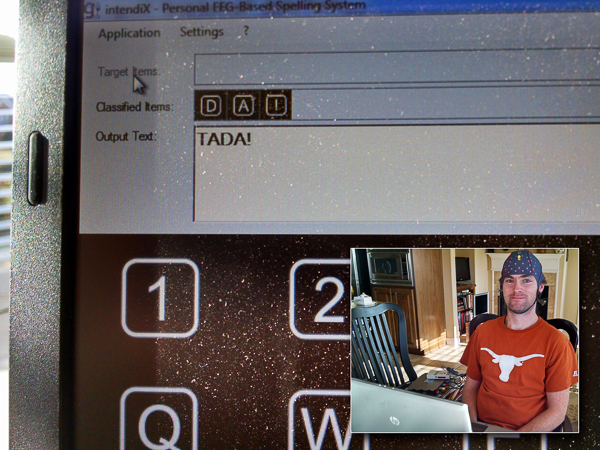 One of our cousins recently learned of the Intel Assistive Context-Aware Toolkit, which allows a webcam-visible user to spell words simply by moving facial muscles, but the software is a tad buggy at the moment, and Chris doesn’t seem to have quick enough focus or motor control to use the software yet (for the periods when the software has calibrated to his face properly and isn’t off in some weird flashing error state). 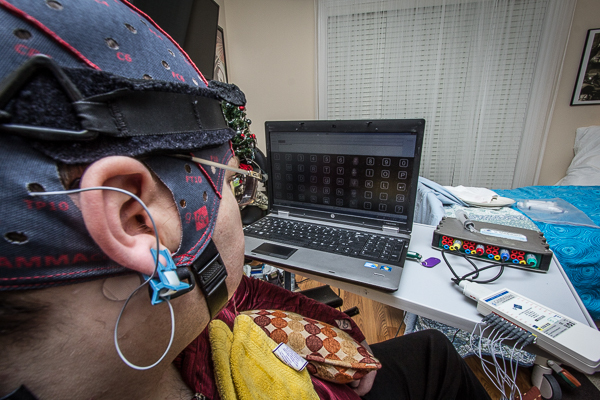 We will definitely keep trying it, though – it’s a much more user-friendly approach than the EEG-based system we attempted last year (the EEG gel is an absolute mess to clean up). My parents returned from what sounded like a fantastic vacation, and spent another week in Austin getting back into the swing of things again. It was unfortunately time to say goodbye to everyone: to my folks, Chris, and to the nursing facility and staff that really helped make this possible, too. The two brothers and mom. Chris is sleeping, heh. 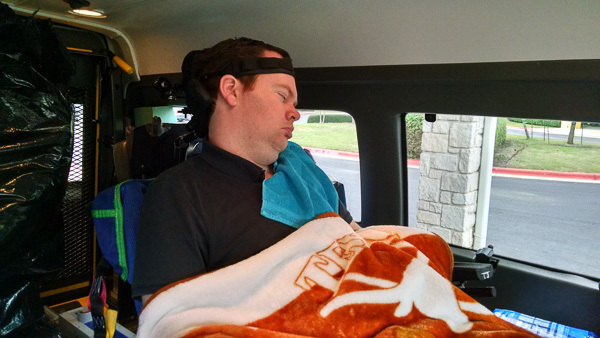 Chris, loaded up into the stuffed wheelchair van for the two day trip back to northern Alabama. So that’s it for this update. I’d like to think this will become an at least annual thing, bringing Chris to Austin for an extended period, while my folks take some much-needed R&R. I’ve been meaning to post an update for quite a while now; sorry folks. I’m going to rewind to late November / early December 2014, when I filled in for my parents while they took a very-needed vacation. The system shows the letter “B” in the center of the screen for 1 second, to indicate the next expected letter to “train”. Entire rows and columns of letters / numbers begin quickly flashing, randomly, across the screen. The letters / numbers of a particular flashing row or column are very briefly – milliseconds – replaced with small photos of a famous actors / actresses (probably to elicit a heightened response to human faces appearing). You simply focus on the letter “B”, and count the number of times the row or column containing the letter flashes. The system kind of converges on the row/column response after about 20 repetitions for each letter. 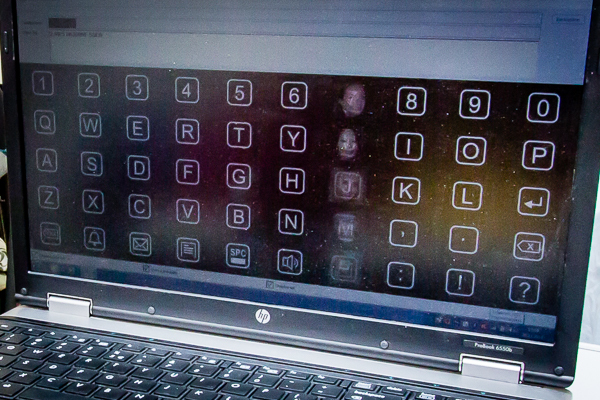 Once you’ve created a classifier, you can begin using the system to actually spell words by simply looking at the letters / numbers on the screen. You basically just stare at an individual letter as the rows/columns flash, and eventually it will pop up on the screen. It’s pretty amazing. 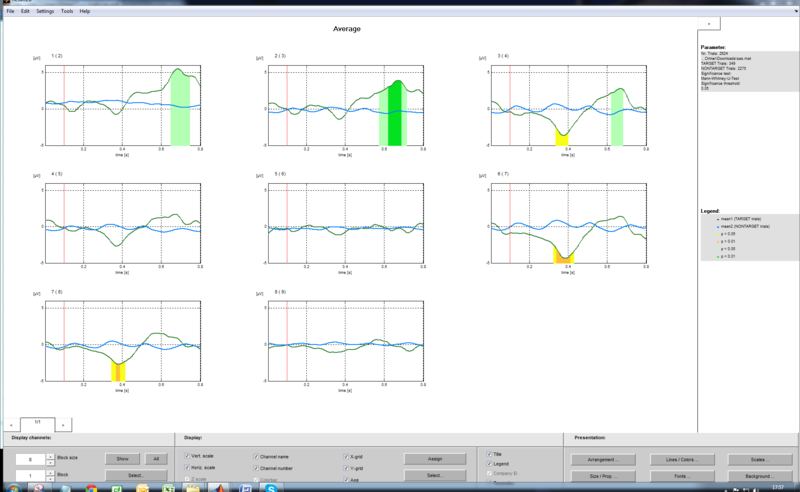 I tried the system out on myself, to make sure I was doing things correctly when I worked with Chris. It was quite reliable and very repeatable – for a fully conscious, healthy person, it was extremely straightforward. The training was short, too – it worked for me after only one training word. No hands! I spelled “TADA!” just by looking at the characters on the screen. Chris started acting a little bit weird – more absence seizure-type stuff (staring off into space) – the day or two before my parents left for their trip. 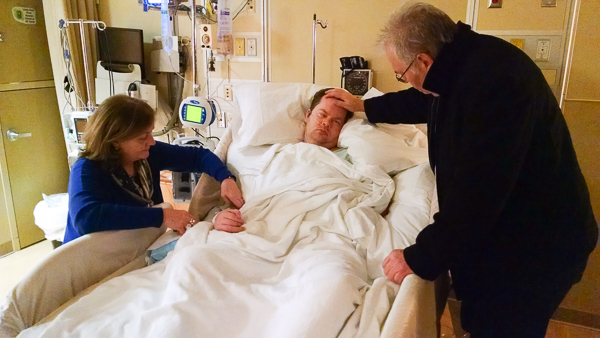 After my folks were out of town, Chris began having nightly tonic-clonic seizures. It became progressively worse and worse as the week went on. Initially it was one seizure a night, then two, then during the day and night, then multiple tonic-clonic seizures during the day. 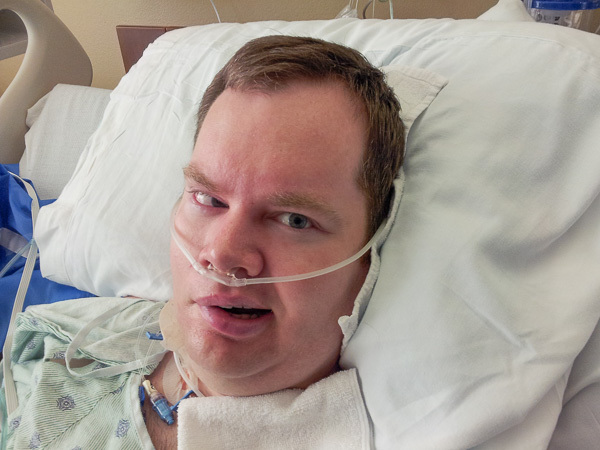 We went to the local emergency room to check for infection, since that sometimes seems to cause seizures for Chris. Tests came back negative, but the tonic-clonic seizures continued to increase in frequency. I made an appointment to see a neurologist after another day or so of this, and he had a seizure in the neurologist’s waiting room! The nurses there had us wheel across the street to the county hospital’s emergency room instead, where things continued to slide downhill, to the point where Chris and I ended up in the hospital’s neurological intensive care unit: status epilepticus (back to back to back to back… seizures). Hearing a hospital-wide neuro response team code announced, surrounded by nurses who had run out of options and couldn’t conceal the alarm on their faces, was a pretty damn scary time. The only thing you can do is basically just knock the person out cold – in this case, using an emergency dose of Benzodiazepines. 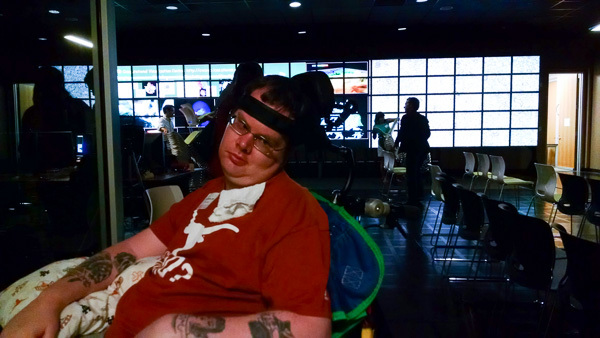 They had Chris hooked up to an EEG for a 24 hour recording, and the seizures continued off and on, just in a non-presenting fashion. My folks knew about one or two of the night time seizures earlier in the week, but this had progressed to the point where I finally had to let them know that I absolutely did NOT have things under control, guaranteeing the vacation THEY REALLY NEEDED would prematurely – but necessarily – come to an end. I was bloody glad to see my parents, and I know Chris was, too. 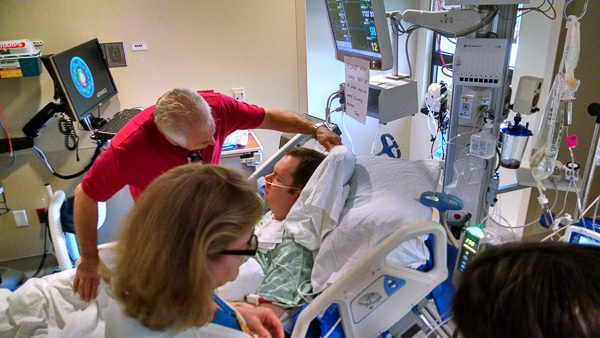 We spent another two days in the Neuro ICU, with the neurologist running through two different choices of anti-seizure medication, before being released to a step-down unit for a few days, and eventually home. 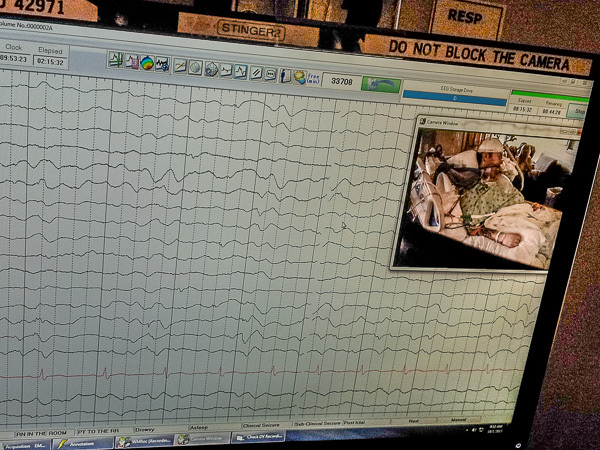 The neurologist had no ideas about any specific triggers for this bout of seizures; he basically chalked it up to “brain injury”, and that was that. Chris is on a new, secondary anti-seizure medication now and hasn’t had any subsequent tonic-clonic seizures at night (and generally seems more alert during the day, which is one good thing that came out of this hospital ordeal). Getting back to the intendiX speller: we’d only been able to use the system twice when Chris had his first night time tonic-clonic seizure under my watch. I decided not to put any further flashing lights – the rows and columns of the intendiX screen – in front of Chris, until the seizures seemed to be reliably behind us. That put things toward the very end of December, a few days before we had to send the system back. D’oh. I spent a few more hours trying to get Chris to train a few words with the system, but we unfortunately didn’t have any luck. The Austrian company looked at one of the data sets and said Chris is having “P300 responses”, but I just didn’t have any luck at all creating a consistent classifier that we could use to spell any words with. 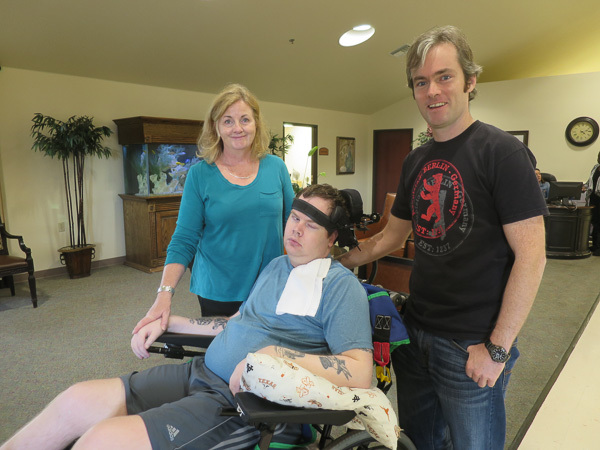 The intendiX system is promising for the future, though, and especially for other traumatic brain injury patients that are perhaps a little further along than Chris. 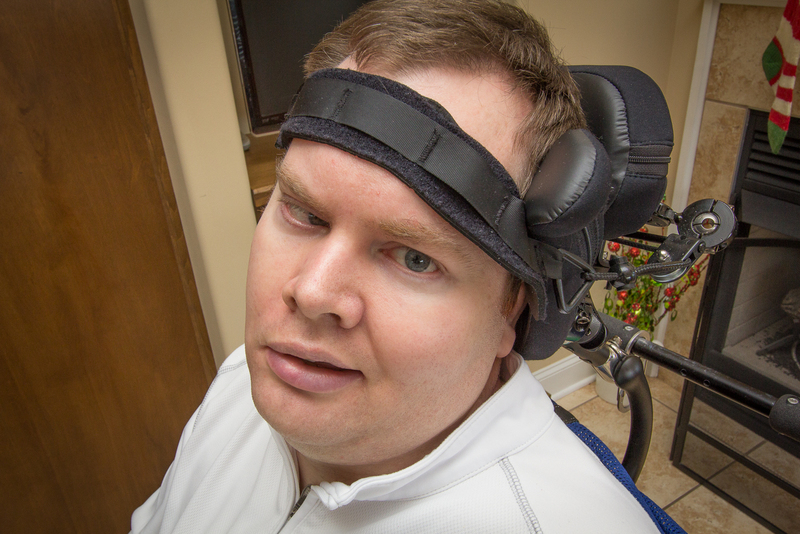 The system isn’t quite turn-key enough yet for my parents to casually use – the electrode gel makes a big mess everywhere, and you have to be really careful about not moving the electrode cap around, which is difficult to do given Chris’s wheelchair headrest, and that he cannot hold his head up on his own. We’ll probably give the system a shot again in the future, when I can spend another week or two with Chris out at my folks’ house. This past November was kind of the first time I’d observed it, in a repeatable – no way, this isn’t just chance! – consistent fashion. There’s still a long bloody way to go, but knowing Chris has comprehension of language is huge. So there’s some good news to wrap things up. Also – my folks might make a trip out to Austin soon with Chris, but we’re still working out the details on that. 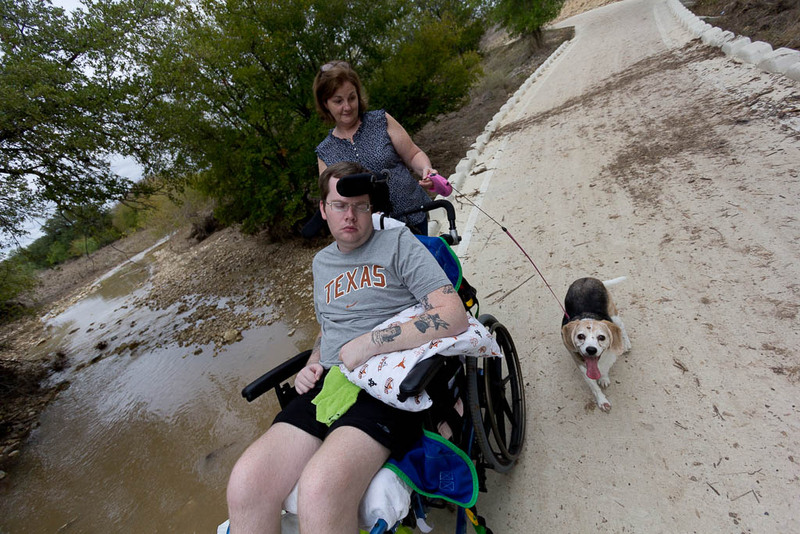 The Town Lake trail – one of our favorite locations to run and solve the world’s problems – is wheelchair accessible. Just a few lines to bring everyone up to date. As I think everyone knows, we are still here in Alabama (where I work), and have Chris with us of course. Chris is physically doing well albeit a little bit heavier than he was before his accident. But he is physically doing well. 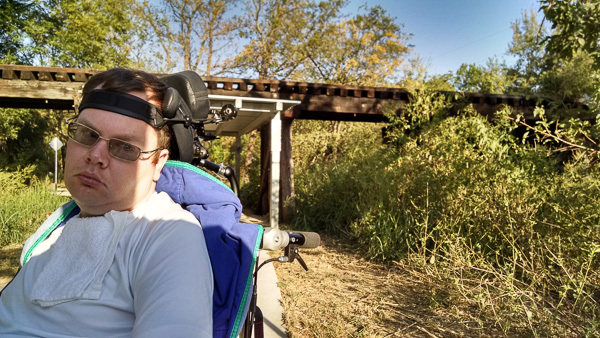 We keep waiting for neuro-medical breakthroughs to provide a “new hope” for helping Chris regain some function. But until that happens, he’s being well taken care of (his mother is a Saint! ), and we keep searching for different things to do to help Chris. We made an “annual checkup” visit to Spain Rehab in Birmingham, AL., where we go for periodic Baclofen pump refills, and much to my disappointment, it was pretty much a wasted trip. I was expecting a bit more comprehensive approach to perhaps some new therapies or alternative treatment protocol suggestions from the Doctor, some news on the nutrition front, but it didn’t happen. They basically said, “yeah, he looks good – anything we can do for you?” I think my expectations were a bit too high going in. I contacted the Shepard Center in Atlanta Georgia, another Traumatic Brain Injury (TBI) Model System, one of 16 in the country, and although we are not candidates for an in-patient program, they have a pretty comprehensive out-patient program that may also provide Chris with some improvements. I know from experience with my dad having a stroke and severe injury from falling down the basement stairs and hitting his head on a concrete floor, the brain heals in seemingly unusual ways. There is, of course, physiological healing or mending, re-mapping of brain function, neuro plasticity, and other descriptions of types of “mending” that goes on in the brain. I know with my Dad that his lost left-side function, over time, literally came back over night when those neuro connections re-joined and those pathways were re-established. I tell Chris that we’re going to get there but it will take time. He’s a strong lad (man – but he’s still my baby) with a lot of perseverence as well as patience, we’ll get there in the end. It will take time but we’ll get there. I’ll keep everyone posted on events regarding moving toward making the Shepard Center happen and, as always, thanks for your thoughts and support- it keeps us going. On a quick political note, push your State representatives for expansion of medicaid to allow for the uninsured in your States to obtain health insurance. We, in the United States, are the ONLY western industrialized country in the WORLD that does not provide health care for its people! The scare tactics of politicians about “socialized medicine” (and the boogeyman) are just that, scare tactics to keep you docile and dependent on your representatives! Ever seen one of these tea party rallys on Youtube where a Senior citizen is holding a sign saying, “Keep your Government hands off my Medicare!” It’s so funny it hurts! Obamacare is NOT socialized medicine, the Veterans Administration IS – but you don’t hear anyone calling for the repeal of THAT socialized system do you? Tricare for our military is more socialized than Obamacare and takes up a good size chunk of the defense budget – in excess of $50 Billion dollars a year but you don’t hear anyone calling for the repeal of that social health system! And they just pumped over $17 Billion dolars more into the VA, money that adds to the national debt ($12 Billion of it). 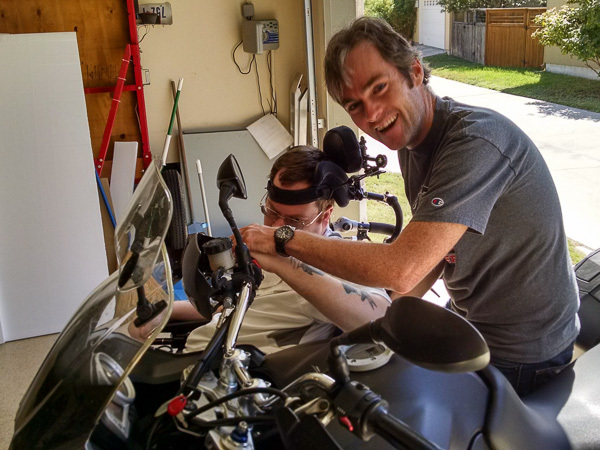 The “real VA story” is that it’s not processing disability claims fast enough! You know, the claims for Post Traumatic Stress Dollars! Look, I was there! the number of PTSD claims doesn’t support the numbers that were actually “outside the wire” in harm’s way. The rest of us were on airbases or Forward Operating bases, you know, where you eat steak and lobster (literally) four nights a week (it’s hard NOT to put on weight during a deployment)! One more and I’ll shut up. We pay over a Billion dollars a year for retiring military veterans in disability compensation for “snoring!” Yes, sleep apnea, generally associated with obesity, costs the tax payer over a Billion dollars of scam money a year! Next time you see a disabled veteran license plate (with no handicap marking on the plate), watch the veteran when he gets out of his truck – does he look like he’s handicapped? Probably not! 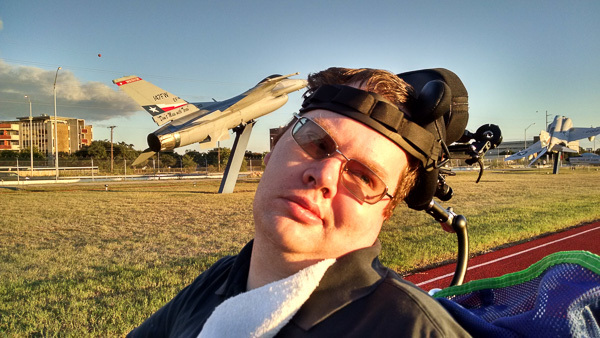 In fact, he’s probably a pilot for United Airlines who has to undergo a full flight physical periodically in order to fly but yet he’s disabled by VA standards. He’s diasabled for the purposes of retirement disability compensation – it puts monthly money in his pocket – but he won’t support paying a dime to a single mother for public assistance or for free lunches for kids! What a world! Off my soapbox. Thanks, we love you all! Just a couple of notes to “catch up.” We never did make it back to New Orleans for the Hyperbaric treatments as we wanted to. The logistics of staying there for 40 “treatment” was just not doable for us right now. However, a new alternative treatment chiropracter has come to town and also has a chamber and is doing hyperbaric. We have to be careful in terms of finding someone that knows hyperbarics for brain injury (not a medically recognized treatment), and we will but it’s another possibility for hyperbaric treatments. I’m convinced the “established medical community” may not necessarily provide the best care for the patients given the financial incentives in our system to provide medical services rather than medical outcomes. In other words, our doctors get paid for services, not outcomes. In fact, ironically enough, a Doctor can literally kill you and he will still get paid! Or he can completely botch a procedure and get paid again for the corrective procedure! So yeah, everything is taken with a grain of salt and a skeptical eye in this family. While most will say, “hyperbarics can’t hurt even if they don’t do any good,” we’ve learned that they can, in fact, bring on siezures if not managed correctly – too much pressure, too deep a dive, etc. 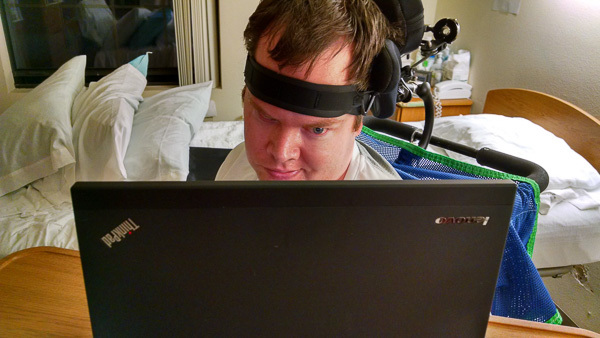 Robert is working a brain computer interface evaluation device from an Austrian company that sounds promising to allow Chris to better communicate and have more control over his environment. More to come. 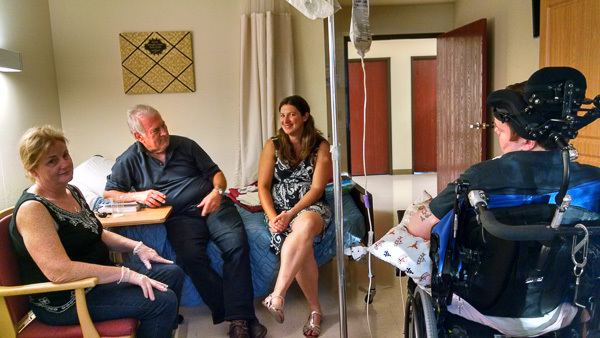 We’re looking at getting Chris into an outpatient treatment program at the Shepard Center in Atlanta, Georgia, another National Traumatic Brain Injury Model System. I have visited the facility, they are very high ranked on a national scale and although an outpatient program, it fould provide about five hours of therapy per day. So that’s what we’re currently working on. And of course, I keep playing the lottery hoping for the big win to let us do some other things we can’t do limited by finances. We’re also working on some home help for Mom, she’s been going like a trooper for three years now and needs a break! Chris seems to be more aware and we can get him to smile pretty quickly after a comment or statement that he finds amusing showing cognitive abilities. We just need to get the motor neuro connections to reconnect to get him moving again. I know Chris, once he gets any movement at all, he’ll take off on his own and nothing will stop him. I’ve never know anyone with more perseverence than Chris! I’m looking at a collage of pictures we have of Chris before the accident and it brings back such great memories. What a great young man, with a warm spirit, caring heart, and a brain that will again, one day, offer us all something to be proud of in terms of his contributions to our collective time here on this cosmic rock! All the best to you all. Thank you for your comments, thoughts, and keeping in touch. 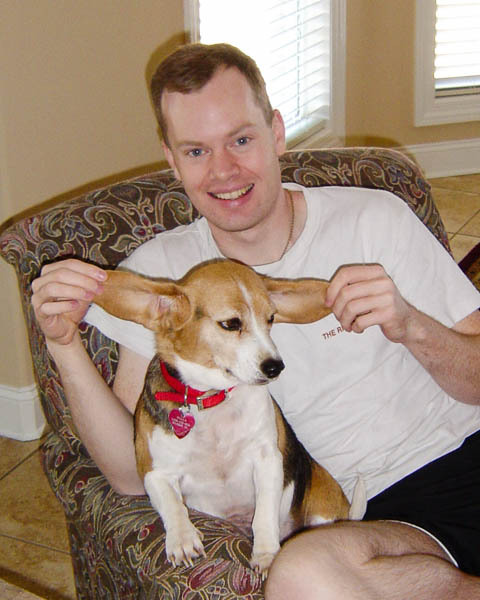 Our second family beagle, Nuala, died quite suddenly Saturday morning, September 21st, 2013, at my folks’ house in Alabama. Looking back through photos of Nuala – and her mother, Molly – reminds me of much happier times. The more recent photos are also a reminder of the struggle that has been the last three and a half years. 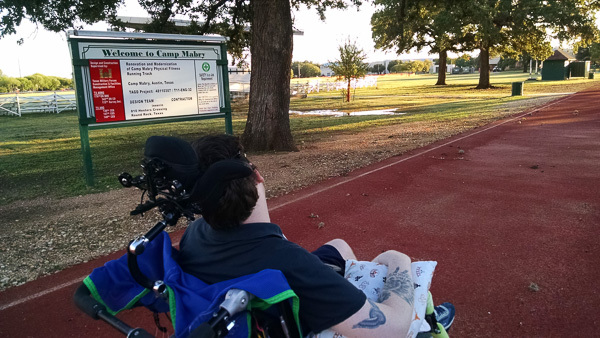 The shady RV park in south Austin, where my parents lived for several months while Chris was at Texas NeuroRehab. Having the dogs at my apartment in north Austin, while Chris was at the nursing home. Back to San Antonio, again in an apartment, near HealthSouth RIOSA. Losing Molly. And Nuala spending weeks looking for her mom. Closing out the RIOSA chapter, and the return to Alabama. New hope, the trip to TIRR in Houston, Nuala always along for the ride. This time in an RV park near the medical center. Molly and Nuala were kind of a connection to the past, and a connection to how things were before the accident. Taking them out for walks, in all these unfamiliar places, was head-clearing and therapeutic: much more for my benefit than theirs. 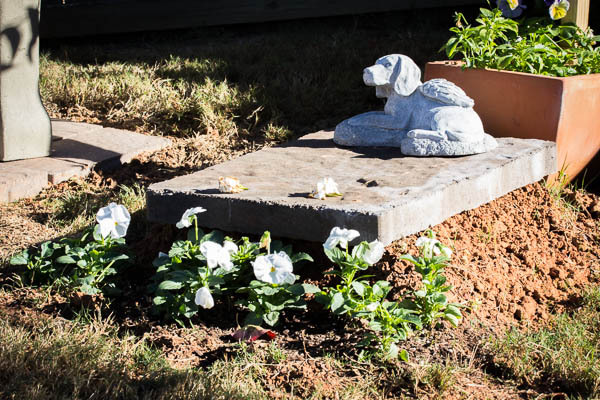 I brought Chris’s wheelchair down to where my folks buried Nuala, along with Molly’s ashes from San Antonio. I could swear I saw a tear welling up in one of Chris’s eyes.